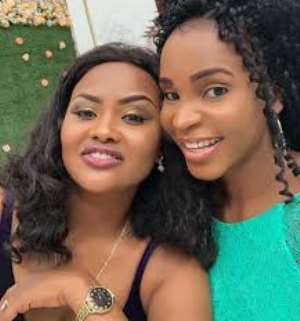 Kumawood Actress Benedicta Gafah has finally cleared the air about having an affair with the husband of colleague actress Nana Ama McBrown. Rumors were that Benedicta was impregnated by Nana Ama’s husband, Maxwell. Nana Ama McBrown however, invited Benedicta Gafah to her cooking show, ‘McBrown’s Kitchen’ and during the show, she raised the topic where Benedicta made it clear that everything that was said regarding the affair was false. Benedicta Gafah added that she was shocked when she saw the news going viral. She said her first reaction was to call Nana Ama McBrown but when she didn’t pick up on the first call, she started getting worried. Nana Ama responded that, she was also surprised but she didn’t allow it to bother her. She added that she knew it was false, so she didn’t even bother to ask her husband about it.